Even though nearly everything about him screamed made-up company mascot, Orville Redenbacher was much more than just a spokesperson: He was the brains behind the operation. 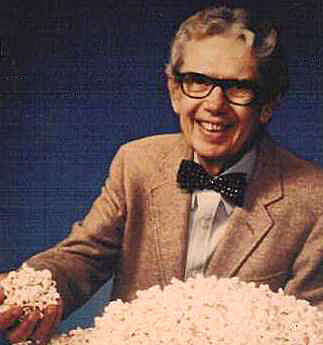 Back in 1965, he and his business partner perfected a popcorn hybrid that was fluffier than traditional kernels, and had fewer hulls. After selling the stuff from the trunk of his car, he went national in 1976, with his first commercial. Orville showed off just how much fluffier it popped, and promised, "You'll like it better or my name isn't Orville Redenbacher." "Grandpa would go for it. He was a cutting-edge guy," Gary told USA Today. "This is a way to honor his legacy."